The unluckiest fisherman in the world! | Ah The Things I've Done! The unluckiest fisherman in the world! I used to think I loved fishing. But really? I begin to loathe it more and more all the time! Up until this year, I loved saltwater fishing, and ice fishing. I still love ice fishing! As a kid, I grew up in Bath, and spent a lot of time on the coast fishing with my buddies for mackerel, striped bass, and bluefish. I will admit, I have caught at least my share of mackerel, and bluefish, maybe even more. Striped bass? Well counting the ones I have caught this year, I would estimate my life time number of legal sized stripers caught to be zero, give or take nothing. Now with striped bass in Maine, you can actually catch a striper that is TOO big to keep, talk about frustrating! I wouldn’t know…Never caught one of those either. I did catch a small one once back in 1994…I think. My friend Zack? He went striper fishing in the Penobscot last week for the first time. It was one of those all night fishing trips after work. The way I hear it, his buddy was all equipped for river fishing with heavy sinkers, and bloodworms. My buddy Zack? All he has is tackle suited for largemouth, and smallmouth bass out of lakes and ponds. He was fishing with night crawlers. I don’t know a single person who has ever caught a striper on a night crawler! That’s ABSURD! You need bloodworms at the very least, but eels are even better! Zack caught his first striper on a night crawler! From what I understand, it was even a keeper! I never saw it, he threw it back! 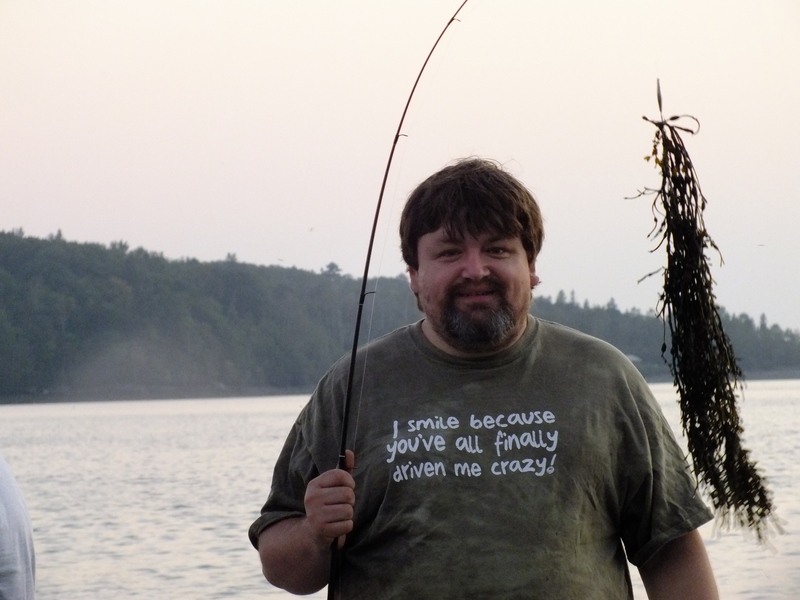 I’ve been mackerel fishing several dozen times in the last 5 years. I LOVE mackerel! And they are loaded with luna 7 fat bi-products, or some other essential oil, so they are good for you! Mackerel fishing is fast and furious! You can use pretty much anything shiny and get plenty of mackerel, but hardened veterans like me? We don’t waste out time with single hooks! NO WAY! Guys like me use a series of red, yellow, and green straws of rubber covering hooks, and ending in a weighted bright silver jig at the bottom, called Christmas trees. That way you can get up to six fish at a time! And from what I remember? THAT is a GREAT fight! The last time I caught 6 mackerel at a time was likely 1984. Since then? Sure, I have caught some mackerel! I mean ANYBODY can catch a mackerel! I bet I have caught 10’s of mackerel since then! Well almost 10. OK FOUR! Are you happy now? I have caught FOUR mackerel since 1984! Now to be fair, my service in the United States Air Force took me away from the icy waters of the Atlantic, and I wasn’t able to go fishing for mackerel. I was stuck in one of the worst places for saltwater fishing I had ever been in my life! Alaska! I fished hard in Alaska! My supervisor treated me to a chartered fishing trip on one of the Air Force’s recreational boats. My poor boss was SO sea sick! He spent half the day leaning over the boat dry heaving, and the other half hauling in fish after fish…Black bass, red fish, green cod, grey cod, ling cod, halibut! Me? Well I wasn’t skunked THAT day! I mean I THOUGHT I was going to be, but in the end? I did catch one really big fish… but that’s another story! Suffice it to say I was NOT impressed with Alaska for fishing! Sport fishing capitol of the world INDEED! Most of the time I can go ice fishing, and manage to pull up a few fish, but think pickerel, and perch. What most hard water anglers call trash fish, I call a great day of fishing! I saw my last salmon in the 80’s, I wouldn’t know a togue if it introduced itself. But I am fine with that! Pickerel are one of my favorite freshwater fish to eat, and since they are so bony, most people prefer to spend their resources going after the classier fish, and leave me alone. OK…Do you want to know just how bad it is? It’s like this. I have a couple of ducks, and they have a 15 inch deep wading pool where they like to splash and preen, but the water gets a bit murky. I thought maybe a few minnows or some crayfish might help keep the water a little cleaner, and give the ducks a little more recreation and nutrition. So the other day I grabbed my minnow trap and headed to my secret spot! You can spot dozens of crayfish in broad daylight searching the rocks in the stream for tasty tidbits, and thousands of creek chubs dart about in a panic when my shadow falls across the stream. OK…That’s a lie. They LAUGH! OK? They laugh so loud the birds take to the sky in fear of the racket! They laugh because they have heard of me, and my reputation. So after the laughter dies down, I chuck a handful of dry cat food into my trap, and toss it overboard. The first thing that happens is all of the cat food floats up through the holes in the trap, and is carried downstream by the current, followed by another burst of laughter from the chubs. I’m NOT giving up! I go back to the van and get a Ziplock baggie, fill it with cat food, punch a few holes in it and head back to the stream. This time there was no laughter from the chubs as I tossed the trap into the water…Because I heaved a big rock in first, and scared the bejeepers out of them! William and Jen were waiting in the van, and we headed into town for some errands. On the way home a few hours later, I grabbed my bucket and headed for the stream. William was playing a video game, and Jen was too scared of snakes to join me, so I would have to lug the bucket full of minnows, and the empty trap back by myself. I get to the stream, and the first thing I notice is there is no laughter, and the second thing I notice is that my trap is surrounded by chubs…No doubt they are terrified, and concerned for their school mates who have been captured in my trap! I grab the rope and pull the trap up to the bridge. THAT is when the laughter starts…The trap was empty. I get back to the van, and tell my loving family what happened, and THEY laugh too! OK! FINE! maybe it was the baggie! Sure! There was no good way for the scent of the cat food to get down stream! SO I’ll go one better! I’ll get DOG food! And maybe they don’t all like dog food, so I will chuck in some cheese too! OH! And FISH! I grab a frozen Pollack fillet out of the freezer, and break that up. I chuck it all into an onion bag so it doesn’t all float away, and I head back to the stream. When I get there, it is pouring so hard, the chubs have gone under the creek banks to stay dry, so there is no laughter. I chuck the trap off the bridge, and leave it to soak over night. The next day, because William thought it was so funny I drag him out with me to see what a REAL haul looks like. In the clear water I can see a dozen or more giant crayfish clinging to the outside of my trap, I can only imagine how many are inside! The chubs are there too, but they are not laughing… This time they are scared! My son is well known too…That kid catches fish every time he has gone fishing since the time he was three! His first fish was a 9 inch rainbow trout! He has yet to waste his time on sunfish and perch like most little kids. He’s into 16 inch bass! “Look at THAT buddy!” I tell him, as I point to the crayfish on the trap. I grab the rope on the trap and give it a pull. Crayfish scatter in every direction…Revealing one pathetic thumb sized crayfish, and a bag of bait in an otherwise empty trap. That’s when the laughter started, and this time? My son was laughing loudest! I hope he enjoyed his walk home!